Wants to be Inside Man meets The Negotiator , but doesn’t get anywhere near close either one of those films. Money Monster is a lousy movie. It’s a film that wants to be so much more than it actually is, and ends up getting greedy instead of being smart. This movie tries to dig into a whole bunch of different pies and genres, while in actuality doing very little. instead of trying to blend other, better films and ideas together, Money Monster really should have been focussing on at least getting one of its stories right. But this one is made for the masses, and not for the thinkers. It thinks it has an edge just because it’s about a unique kind of show, and that normally would be enough. Only this movie doesn’t spend any time on that idea, and instead bounces right away to the next one. And that next one is holding the show hostage. Money Monster wants to be about a Jim Kramer like financial advice show. Cool idea. But then it also wants to be about a hostage situation. And then it also wants to be a behind the scenes scandal and corruption kind of mystery. The result is pretty much a mess, and that’s because the movie never stops to ask the audience if they even care. It doesn’t do anything to give us a reason to care for any of the characters at all. Take Lee Gates, (the Jim Kramer character, played by George Clooney,) for example. He is the host of the show, and an absolute showman. He’s a guy who is all flash and no substance. And we get to see and learn very little about his actual character. Considering that he’s single and rich, a cool way to start this movie might have been seeing him out on a date, thinking he’s a big shot, and trying to show off, while really coming across as a jerk. But this movie isn’t interested in establishing character. Every scene of Gates in the first half takes place inside the studio. That’s where we meet Gates (as well as everyone else,) and that’s where we stay with Gates, as if experiencing a prison sentence. But the movie isn’t about Gates or his show. It’s about the day the show got held up and taken over. In that sense, this is really just a simple hostage movie, and nothing more. I say simple, because while it might look to some of the better hostage movies for inspiration (The Negotiator, Inside Man,) this movie in no way takes anything worthwhile away from those films. And you can imagine the meeting of executives who produced this film, saying let’s make a movie about a financial scandal and coverup and then combine it with a stock market advice show and then combine that with a hostage negotiation situation. Talk about biting off too much. If this movie had just been about the show itself, and how it came to be, it would have been a hell of a lot more interesting. The movie that we do get, on the other hand, is an total waste of talent. There aren’t any real characters here. Clooney dances around and wears ridiculous outfits and this is supposed to be enough to make us laugh. It doesn’t . And it also doesn’t disguise the fact that there isn’t a single plot line which gets real attention. There are only four real characters in this movie, and none of them is given the kind of writing or development needed to pull off this sort of thing. The four characters are Lee, Patty Fenn (the shows producer, (played by Julia Roberts,) Kyle (the guy who takes over the studio,) and the villain, Walt Camby (Dominic West.) Each of these characters is given the bare minimum of writing, back story, and character development. There are other talented actors in this one too, like Giancarlo Esposito, from Breaking Bad, only they are actually given even less to do. The reason to see this movie is supposed to be Clooney and Roberts. Two stars that were once Americas sweethearts, headlining the Oceans Eleven films. They were once the number one go to actor and actress in a Hollywood. Not so much any more. Especially in the case of Roberts, who barely acts these days. Now, that’s not to say that it isn’t her choice, (I imagine it probably is,) but movies like this one certainly do her no favors. Her character, Patty, stays behind the scenes, in the control room, for the entire movie. She doesn’t get any memorable dialogue, and we learn more about her from other characters than we do from watching Patty, herself. Pattys only hint of a back story involves the supposed secret that she might be leaving the show to go work somewhere else. And the apparent reason is that she doesn’t like Gates. Sounds interesting, right? It should be. Only the movie doesn’t show us any of that. It doesn’t give any examples. This is all telling and no showing, which makes her situation about leaving get chalked up to a big fat Who Cares? If the movie had given more time to that storyline, like flashbacks that show why she doesn’t like Gates, it could have been a lot more interesting. At one point, I believe it is even hinted at that they once had a relationship. How about a little more than just hinting at that? The stories behind Kyle and Walt Camby are even worse. Kyle is a guy who bet big on some stock advice from Gates and lost it all. Now that’s lousy, and we feel bad, but taking hostages over it is just plain stupid and ridiculous. As if Gates was in on the take or something. But of course there has to be a villain, and that’s where the Camby character comes in. He’s the head of a huge company, that went under and lost a lot of people great deals of money. And apparently this was all intentional and very illegal. And all of it seems phony as hell. Not that this sort of thing doesn’t happen all the time, (Enron, Bernie Maidoff,) but the Camby character seems like a walking cliche in every respect of the word. From the way that he is barely shown in the first half, and kept hidden so as to create a fake sense of mystery, to the way he becomes the star of the second half, everything about this character seems phony and manipulative. And it’s not the character that is manipulative, but the movie, trying to mess with the audience, and being extremely transparent about it. 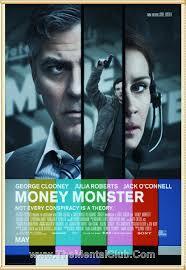 Unfortunately, even some of the things that Money Monster tries which should work, just don’t stick here. This includes the use of real time. The movie takes place in the exact amount of time that is on screen. This might be a gimmick, but it’s normally a cool gimmick that works. Not this time. That’s because in the case of this movie, it actually hurts the film. It cripples the movie, making it so that we can’t get any backstory, flashbacks, or character establishment at all. We are completely limited to the studio, and into only seeing what goes on inside it’s boring walls. Any hope at developing characters or stories outside of this tiny window of time is washed away by the idea to set this movie in real time. Now, on the positive side, this movie does keep us watching, with the hope that something better might come along. There’s no question about it, Clooney and Roberts are like able stars that we want to spend time with. Only the movie starts with that and it really doesn’t give us anything else, during the course of two hours. These are movie stars who usually choose their projects well. Clooney, in particular, has made some great movies over the past ten years or so, from Syriana to Michael Clayton. Only sooner or later, it becomes hard to find great roles. Especially when you only take realistic stories, something Clooney has done ever since he embarrassed himself with Batman and Robin. But there’s got to be a balance. There are realistic superheroes, for example, that you can still look cool while playing. Just ask Robert Downey Jr. about Iron Man. And there’s no reason why a George Clooney has to take crap like Money Monster, instead of fun movies like that. Maybe it’s just as simple as that this movie tried to do too much and to be everything all at once. You have to figure that even a small change, like not setting the movie in real time, could have made a huge difference. A better movie would have not been told about this hostage situation at all, and instead, would have been about the show and its development, but even still, at least give us something about the characters. At least put in an attempt to make us care. This movie doesn’t do that. It doesn’t show the effort. It’s the film that proves that not every movie about the financial crisis is smart. Sometimes you need to think about the audience and giving them something unique. And giving us the same kind of plot we’ve seen a thousand times before, but just setting it in a new location, doesn’t quite cut it. Especially when you’ve got no interest in developing characters. This movie makes a few too many mistakes and really should have known better.